Carding a bird does not involve seeing if a game bird is old enough to drink in your state, though you may want to buy that bird a drink after it spends a day doing the real thing. Read on. Especially when training young or inexperienced dogs, it can be helpful to simulate the natural flush of a bedded-down bird. But in practical terms, it's not always appropriate to kill the bird on the wing, or lose it as it flies off. Carding a bird means hobbling or tethering it to an object using a soft string (such as synthetic yarn). Rather than tethering it to a fixed object on the ground, though, carding the bird allows it to get up and fly, but with enough drag that it quickly wants (or has) to come back down. Usually, the bird is tired enough to be easily caught by the handler and put up for later use. It's important not to give the bird too much access to trees or complex hedges, as they can easily get hung up out of reach. Unless you're prepared (with shotgun, airgun, etc.) to kill the bird, it's not reasonable to leave it under such circumstances, no matter how much you also admire the local hawk population. 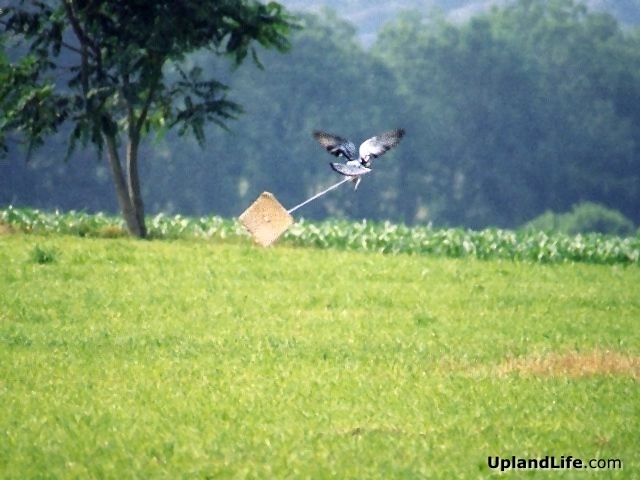 A predator dispatching such a hung-up bird may also get tangled up. Trainers have used cardboard forever, but some have started using plastic material such as corrugated vinyl cardboard-like sheets (often used in signs), or foam-core, which resists moisture. Wet cardboard gets much heavier, and wears out more easily. Depending on the type of cover in which you're working, you may also want to round the corners of the material to reduce the odds of the card getting caught. Some trainers call this a "disk," so you may hear of "disking" a bird, which is essentially the same thing. Another variation on the use of the carded bird is the near-distance planting that you can achieve. When planting a bird for training by hand, the planter's footsteps are like a scented roadmap that a dog can follow right up to the bird on the ground. That not only doesn't teach the dog to appreciate a normal bird's scent cone, but it deprives the trainer of a chance to see what the dog can do with scent that's wafting from a distance, with no right-under-the-nose distractions. To take advantage of this, walk several yards off from stripe of cover, and toss the carded bird that direction. With some luck and practice, you'll match the card size to the bird, and be able to predict about how far it can make it before it drops down in to the cover with its tethered payload. The result is a weighted-down bird settled in nearby cover, with no human scent for the pup to track.